Sri Lanka located at the southern tip of peninsular India is strategically important for India in the most comprehensive sense. This island nation lies astride the major sea lanes of communication from Europe to East Asia and the oil tanker routes from the oil producing countries of the Gulf to China, Japan and other Pacific countries. In the military sense it is important to the United States as these same sea routes are used for transference of naval power from the Pacific Ocean to the Indian Ocean and the Gulf. India too has a vital strategic stake in Sri Lanka for her own security interests. An unfriendly Sri Lanka or a Sri Lanka under influence of a power unfriendly to India would strategically discomfit India. Sri Lanka is also strategically important to India in terms of her Indian Ocean strategy and in terms of networking of partners for her aims of establishing an Indian Ocean Rim Community. For the Indian Navy , it is important as the switching of naval fleets from the Bay of Bengal to the Arabian Sea and vice versa the fleets have to take a round of Sri Lanka. 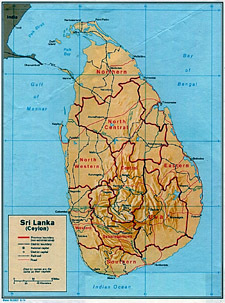 The strategic importance of Sri Lanka was well realized by Britain for the security of both British India and the Indian Ocean and they developed a major naval base at Trincomolee on the eastern coast. Sri Lanka has by and large been friendly disposed towards India despite the complications caused by the minority Tamils of Northern Sri Lanka involved in a long insurgency and terrorism demanding an independent state of Eelam spearheaded by the LTTE. India too has in the past before the IPKF operations of the 1980s had on a number of occasions extended military assistance to ward off security challenges to the Government of the day. In the recent past ,Sri Lanka has been pressing India that both countries should sign a Defence Co-operation Agreement and also that India should extend assistance and her influence to control the resurgence of violence and terrorism unleashed by the LTTE . India however has been dithering, on account of India's domestic politics in Tamilnadu. Since the Tamilnadu elections were imminent the Congress Government wanted to play it safe as LTTE enjoys support within a section of Tamilnadu polity and the Congress's coalition partner. This is despite the fact that the LTTE was involved in the assassination of Rajiv Gandhi, the husband of Congress Party President Mrs. Sonia Gandhi. This is a classic case where India's foreign policy is being determined by domestic politics compulsions at the cost of India's national security interests. National security interests demand that a stable Sri Lanka can be ensured by India signing a comprehensive Defence Co-operation Agreement with the island nation and committing herself to its security. A civil war in Sri Lanka is not in India's interests and nor the division of Sri Lanka for forming an independent Tamil state. The LTTE has already been listed as a terrorist organization by the United States and after much reluctance recently by the European Union. The next thing that the LTTE could be expected to demand is a Greater Eelam comprising Northern Sri Lanka and the Indian state of Tamilnadu. Besides the many military advantages that would flow in an India ' Sri Lanka Defence Co-operation Agreement, would be the likelihood of India getting a lease of the Trincomolee Naval Base or access to it for the Indian Navy. This base has a sizeable naval infrastructure and large oil storage facilities which can be revived. It would be a big strategic gain for India. Strategic opportunities are always fleeting ones and so is the case of India forging a strategic partnership with Sri Lanka. If India dithers because of domestic politics compulsions, China is waiting in the wings to fill the vacuum. The Chinese strategic encirclement of India would then be fully complete and India will have no one to blame but itself.